Star Wars inspired Halloween costume designed to look like the All Terrain Armored Transport (AT-AT) walker. 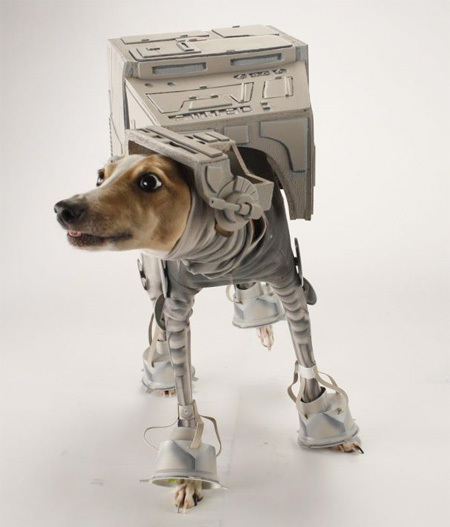 Unique costume was made by Katie Mello for her Italian greyhound dog. agreed Niyari. Looks cool but how do u move????? I think most of it is just printed spandex. And then part of it is stuck around the dog’s ankles. Really cool, though. This looks awesome and adorable, but I wonder how comfortable that is? Would the dog get hot if he were at an indoors Halloween party or something? Cute, though! Poor dog, I think it could hardly move!! It is a very sad day for all costume dogs but for cats its another step to the darkside! No one cares if the freakin dog looks uncomfy. PORR DOG!!!!!!!!!!! I DON´T LIKE!!! Dressing up dogs is weird, but not cruel. It’s no different to dressing up your children. They may not be very amused, but it doesn’t harm them in the slightest. It’s vaguely manipulative at worst, and because it is Star Wars – I love it! Terrible. The dog can hardly move in that. Don’t panic, these kinds of dogs like it! I dressed mine like a tree and he was so happy!! 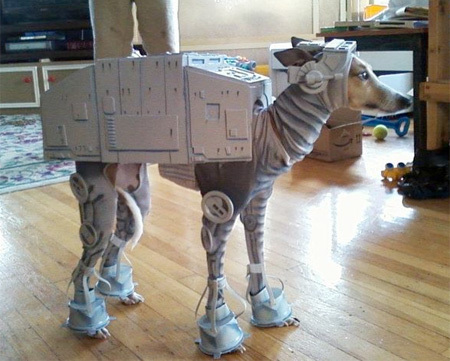 it’s a very creative costume and it suits the doggy very well! That’s adorable, but it looks very uncomftorable. I believe this is the funniest thing I have even seen on Toxel. For the first time in a very long time i really LOL-ed. To all the dogs in my neighbourhood that wake me up or keep me awake with their stoopid continuous barking….HA! Katie, would you be interested in making one for a full-size male greyhound? Of course it can move, why else would she make it ??? If you look closely most of the outfit is fabric, only has cardboard or whatever they used on the top shell and the outside of the legs somehow adhered to the fabric, there shouldn’t be any maneuverability issues at all. Looks awesome, but from my experience most dogs don’t like to wear clothes. My dog would love this. He loves clothes. When he doesn’t have any on he goes and gets it from his clothes bin and barks till it’s on. So don’t say all dogs hate clothes. Fine in the winter since he gets really cold, more annoying in the summer. Fantastic. You should win an award for this. It’s def better than the new blu-ray boxset…..
That dog looks so scared. You know, I volunteer in the animal cruelty investigations department for our local human society and I see really horrible things people do to animals. While I admit the dog might not be as happy as optimally he could be, a few minutes wearing a costume that mildly inconveniences him is really not that big a deal in relation to a lifetime of love and affection from his owner. and @Ninja Egg: yes AT&T *is* involved. Never looked at their logo? Yea, well, supposedly the photos of Iraq showed places for WMDs, and guess what? There were none. Instead of assuming the worst, how about asking? You know, like in real life. You are polite and courteous in real life, right? Try it online, too. You might come across as being less burn-the-witch and more socially apt. You can really tell the dog likes it by the look in its eyes in all the pictures…Especially where his tongue is sticking out. I raise and show Italian Greyhounds and I can tell you from lots of personal experience that this little guy may look inconvenienced but as Melissa said, the lifetime of love and commitment that this owner is sharing with her pet is absolutely priceless. My daughter and I not only have sweaters and jackets for our dogs but we have several costumes too. All of our IG’s LOVE to wear clothes. It may take them a while to get used to a new sweater or jacket but they eventually love them. I’m quite sure this IG will not be wearing the costume long enough to learn to love it but given the time it would become natural and he would play in it just like any other outfit. Please try to not be so judgemental about things like this just from pictures. You have absolutely no idea what a dog is thinking or feeling unless you know the dog personally. I’ve had many IG’s that pull their ears back and look totally tortured when you are putting an outfit on them only to break into puppy wiggles and leaps and rolls as they play with the other IG’s around them once their sweater/costume is on. I actually have pictures of one of my puppies wearing a Darth Vader costume from a few years back. On a slightly silly note… This would make an absolutely amazing costume theme!! 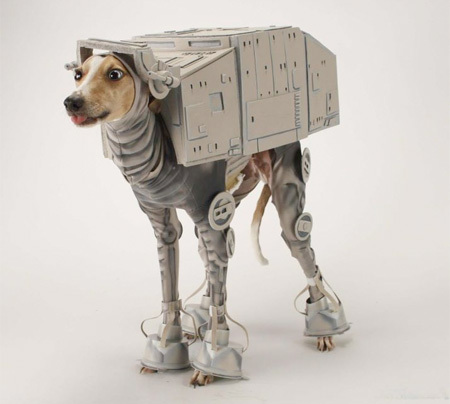 If you could make these AT-AT costumes for several full sized Greyhounds and then make small “speeder” costumes for teacup chihuahuas it would be absolutely awesome!! You’d win any costume contest out there!!! LOL I’m extremely impressed with your creativity, Katie!! Very authentic looking blasters on the headpiece too!! OH!! By the way… Does this IG really have one blue eye and one brown eye??? I have only ever seen one other IG like this before!! Very unique and rare in this breed. Yes.. it’s so cruel the dog is smiling in some of the pictures. If you don’t think dogs can smile you don’t know dogs very well. Made an outfit now I just need a dog. Just ordered a dog off the net so should hopefully arrive tomorrow depending on post. How often would you need to take the outfit off the dog on a month to month basis? 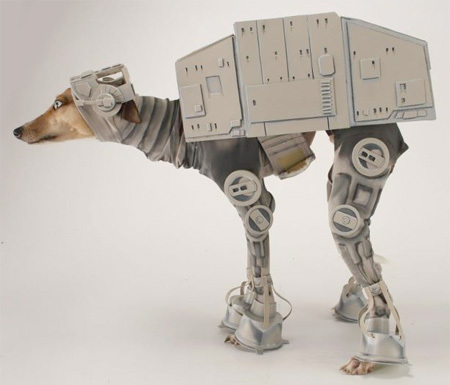 I’m thinking of calling the dog At-At and keeping the outfit on most of the time, I’ve even designed a mouth hole etc. I have a half-Italian greyhound and he always looks nervous. 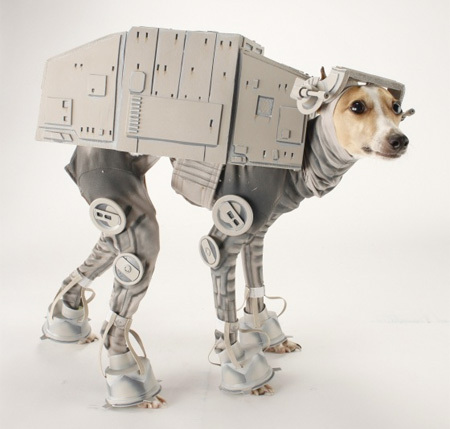 This dog can move, it isn’t a real cyborg costume for crying out loud! Seriously, I want one, where can i get one? You are all terribly sensitive and politically correct. a) It looks hilarious and adorable. b)It appears the costume is primarily made out of spandex, therefore very flexible. c) Any hard bits of the costume are placed where it does not inhibit the dog’s movement. d) Sighthounds always look nervous (I have one). e) It probably enjoyed being fussed over.